Hector is a Texas native, originally from Falfurrias but has called San Antonio his home for the last 15 years. 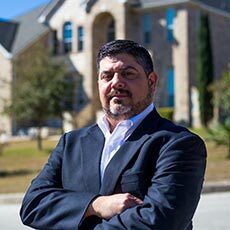 Graduating from UTSA with a Finance degree, Hector has experience as an auditor and an underwriter before becoming interested in Real Estate. With his extensive knowledge in underwriting, he is confident in the documentation and procedures of the real estate process from residential, short sales and new home builds. Hector finds pride in helping clients achieve their dream of owning a home and being a part of providing them with a sense of accomplishment. He believes there is nothing more rewarding than the look on his clients’ faces when they finally receive the keys to their new home! He also has interests in helping clients find investment properties and helping them build their portfolio. In his free time Hector is an assistant coach in youth soccer and basketball with the Archdiocese of San Antonio. He also loves camping in his family RV and visiting his South Texas ranch with his wife of 16 years, Melissa and their two children, Isabella and Esteban.